Succulents are an underrated plant when it comes to landscaping. But did you know that there are dozens of options available? There are succulents that turn pink, crawl, and even flower! They are the perfect addition to add a vibrant pop of green to your garden. Planting succulents is not just limited to dry environments. They can thrive in the pacific northwest, are pretty low maintenance plants, and our some of our favorite plants to use in a garden! Be prepared to be inspired with 7 unique outdoor succulent garden design ideas. Succulents are amazing plants; they can grow and thrive in almost anything. This list is just the start! Get clever, have fun, and experiment with different containers. Think about the style of your home or garden and try to complement it, keeping your outdoor succulent design ideas in mind. Options are only limited by your creativity! If your entryway or garden has a walkway, consider sprucing it up! Landscaping your walkway with succulents and rocks is an easy and quick to add a pop of color and add the appearance of a lush border. A benefit of lining a walkway with succulents is that they are extremely hardy. You won’t need to worry about guests walking too closely and damaging your plants. Another idea to consider is planting crawling succulents between the stones or pavers that make up your walkway. This will help add a more natural look to your garden and create a unique effect! Succulents come in all shapes, sizes, and colors, making landscaping designs endless. 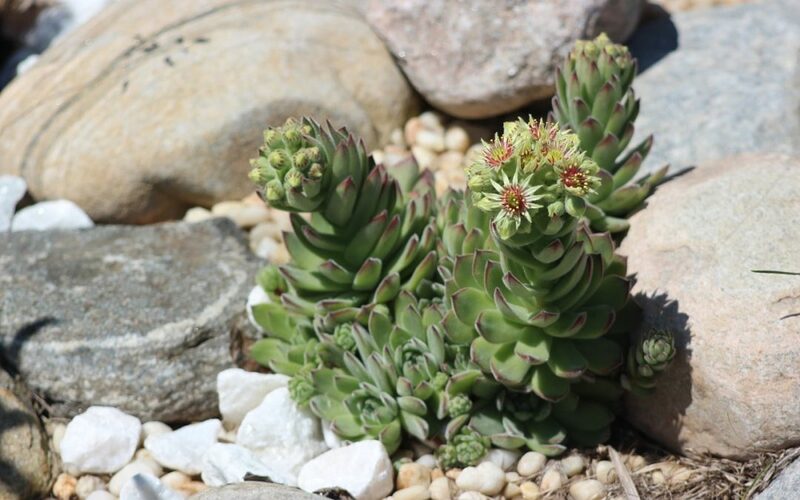 Next time you’re at your local garden store, scope out their succulent offerings and start to think about how you could incorporate a unique design into your garden. It will be sure to impress! It doesn’t have to be the holiday season to display a wreath. Pro-tip: You can also buy a sphagnum moss wreath frame that is already put together! If you choose not to use a ready made moss wreath frame, lay out the wire frame to measure how much mesh you will need. Then, fill the nylon mesh with moss, and attach to the frame with twine. Next, you’ll need to soak the moss in water until it is saturated (do this for the ready made one too). Finally, poke the succulent cuttings through the nylon mesh and into the moss. You can secure them with hair pins if they feel loose. Remember not to plant the succulents too close together, they will grow over time! You can hang your wreath immediately, or to give the roots a better chance of establishing themselves, lay it down for a week or so (it can be used as a center piece)! Another good use for succulents is to plant them as “fillers”. Any place in your garden or containers that look empty, is a great place for a succulent to live. It’s a simple idea but will elevate the look of your garden. When filling empty spaces, consider the color, texture, height, and type of succulent you want to plant. You will also want to provide them with specific soil, cactus soil, and make sure that they will not get overwatered where they’re planted. Some succulent varieties can take on more water than others! Have you been considering adding a zen garden or desertscape to your garden? If so, succulents are the perfect plant to accomplish this look! Depending on what look you going for will determine which succulents should be planted. Regardless of the direction you take, this is another opportunity to incorporate landscaping with succulents and rocks! Both styles compliment this landscaping pairing and are timeless. Adding a water feature will add another special aspect to your design as well. Our landscape designers can help turn your landscape vision into a reality. Crowley Landscape Management designs, installs, & provides regular maintenance for all landscape types. Get in touch today to start your landscaping project!